Begin the season of Lent with us with Ash Wednesday Worship on February 18, 7:30 p.m. 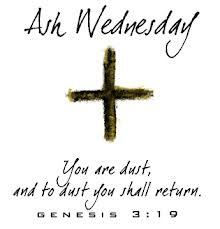 Receive ashes (a reminder of our mortality) and Communion to start you on your journey through Lent. This entry was posted in Uncategorized on February 16, 2015 by lyonsvillechurch.